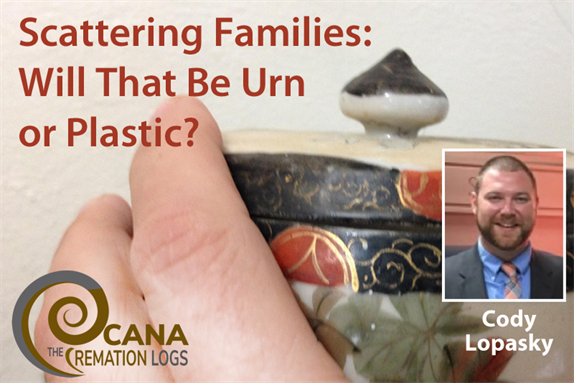 Scattering Families: Will that be urn or plastic? The Cremation Logs presents the first in an occasional series featuring guest posts from industry experts. 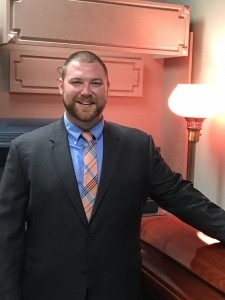 Cody Lopasky is the Associate Dean of Academics and Distance Education Coordinator at Commonwealth Institute of Funeral Service and teaches both face-to-face and online courses. Lopasky enjoys writing and academic research; especially in regard to funeral service. He has published numerous articles, written a continuing education course for funeral service practitioners, and was a contributor for a funeral service education textbook. He is also a licensed funeral director/embalmer and a certified crematory operator. We may see a time when burial becomes the new cremation – something chosen by only a handful of families. This was the norm for cremation only a few short years ago, and the same could be coming for burial. The trend toward cremation is nothing new, but what are cremation families doing? And what are we offering cremation families to achieve their goals? Cremation families who keep their loved one’s cremated remains on display at home are willing participants in selecting merchandise, but scattering families (or the undecided) present a situation that can be vexing for both you and the family. Without a firm plan in place, how can you effectively guide them to a decision that makes sense? Should they even buy an urn, and if so, what type and when? When an urn is not purchased at time of arrangements, most families receive their loved one’s cremated remains in the plastic “temporary container.” This gray or black plastic box can be presented to a family in a velvet bag, but it is still nothing more than a plastic box. Many cremation families are offered a package that includes a “temporary urn.” They may not be shown an example of a temporary urn and may not realize it is a plastic box, but they know they don’t want an urn from the selection room. Offering a temporary urn in a package is a business decision made by the crematory or funeral home; normally due to cost or necessity. On the other hand, some forward-thinking businesses have chosen to provide a spun bronze or cultured marble base option that can be upgraded or personalized. However, the decision to stick with the bare bones (pun semi-intended) should not be made in haste. Of course, the funeral home wants the scattering family to get an urn because it can help pay the bills for the month and it’s also a more dignified choice, but choosing an urn is often the best choice for the family, too. Before scattering, many families have a service of some kind to memorialize the deceased. If the cremated remains will be present for the service (e.g. a ceremonial scattering or memorial service), then a dull plastic box may not be the best option. A family can report that their loved one preferred scattering, but we all know that services and merchandise are for the living. The deceased is no longer here to care. So, when you hear the word “scattering,” do not automatically assume that the family understands what that entails or is choosing a plastic box over an urn. The voice of practicality will say that a simple and disposable plastic box is all that is needed without the knowledge that these can be difficult to open and are not always resealable. Remember that there should be some thought that goes into choosing the container that will hold what is left of a family’s loved one. This is especially true for scattering since the exact date and time of that event is normally set much later. In fact, internal industry research has shown that roughly 80% of families that say they will scatter have not done so by 5 years after the death occurred. This means that if the plastic box was chosen, then it will be sitting on a shelf for some time. Asking a family where the scattering will take place is a great question with which to start. If they plan to do it on the water, then many suppliers and vendors now offer biodegradable urns that will actually float, sink, and/or disintegrate. Using one of these will keep the shore winds from blowing grandpa back onto the deck or into the crowd of family members. If the urn is to be opened for scattering, then ease of entry will be of great importance to the family. That $1,200 piano wood urn may look pretty, but the family may not want to remove 6 screws and scratch up the bottom before they are able to scatter. A good rule of thumb is to show scattering families urns that can be opened easily. Screw-top and chest urns are great examples. Most funeral homes do offer scattering urns, but they can have an inherent flaw that is unnoticed until the scattering occurs: What does the family do with it after they have scattered the cremated remains? This is an opportunity to present the features and benefits of different styles of urns for scattering. A family may not realize it at the time, but the oblong, sliding-top box that they purchased has no purpose to serve after scattering. The benefits of chest urns include attractiveness, utility, and (often) reasonable prices. Many chest urns either come with a plastic container already inside or they will fit the one from your crematory. Using these urns will allow the family to have a presentable container until scattering can take place, and then once it is empty, the chest can be used for a variety of other things, such as mementos of the deceased – old childhood photos, mom’s seashells, vacation matchbooks, dad’s army medals, etc. Psychologically, the empty container can serve as a quasi-replacement for a grave or niche. Obviously the two are quite different, but the positive benefits can be generalized to both. An urn (although empty) that held cremated remains is a tangible and physical reminder of a loved one. It’s an object around which survivors can reminisce and provides that missing link to the cremated remains which are now irretrievable. In a world where cremation is taking over, we funeral directors need to change our thought process. The revered casket is now being replaced by the once-inglorious urn. Traditionally, picking out a casket was an integral and prominent part of the arrangement conference. This is now transitioning into the selection of an urn, temporary or permanent, for cremated remains. It is essentially the same concept (a vessel that will hold earthly remains) but on a much smaller scale and with nearly endless options. This is where a funeral director’s experienced advice can really be helpful. Scattering families (and those that are undecided but may scatter) often think that they do not need an urn. The passive funeral director will take this as a cue and move on without any more conversation on the topic. The active funeral director will discuss the options available to a scattering family and educate them so that they can make an informed decision. Some client families may choose cremation because of the price, but that does not mean they want or need a plastic box – even scattering families. A funeral home’s operational success and sustainability will become reliant on the ability to properly offer and promote cremation merchandise and services. One area within the broad umbrella of cremation in which many funeral homes may fall short is with families who intend to scatter. It is easy to dismiss them as simply another family not getting an urn, and then, they in turn are led to that conclusion by the funeral director’s subtle cues and passive approach, but that is a missed opportunity. This is not simply about the bottom line but rather an opportunity to do what you do best – educate your client families and present appropriate options that meet their needs. If done correctly, this can make both sides of the arrangement conference happy. Yes, some families will still go with the temporary container, but with proper guidance, the curse of the plastic box can be broken. Cody Lopasky has an M.A. in Psychology and History from the University of Houston-Victoria, a B.A. in Psychology from Texas State University-San Marcos, and he is an A.A.S. graduate with honors and distinction from Commonwealth Institute of Funeral Service. As a student at Commonwealth, Lopasky was a member of the National Funeral Service Honor Society. He is a Texas-licensed funeral director and embalmer as well as a certified crematory operator. Starting in high school, and continuing after licensure, Lopasky worked at Schmidt Funeral Home in Katy, TX. He was employed there as a funeral director and embalmer for several years before joining the education side of funeral service in 2016 when he accepted a full-time faculty position at Commonwealth Institute of Funeral Service. Currently, Lopasky is the Associate Dean of Academics and teaches both face-to-face and online courses. Lopasky enjoys writing and academic research; especially in regard to funeral service. He has published numerous articles, written a continuing education course for funeral service practitioners, and was a contributor for a funeral service education textbook.